Ok, I have to admit – I have a massive weakness for little kids in dungarees. It is just the absolutely cutest thing in my eyes. They are the perfect mixture of adorable and practicality, and so I have been very excited by this review, as these Dotty Dungarees are just gorgeous. The dungarees and dress both came packaged in a cotton drawstring rucksack – what a sweet idea & the girls are enjoying storing toys in their bags. We were sent some Summer Pink Stripe dungarees for Lydia in size 2-3 years, and Dotty Denim Dress for Georgie in size 4-5 years. How cute are these?! The girls really love them and Lydia especially has asked to wear her “pink dungees!” several times since her first outing with them. The denim is really gorgeous and the cotton jersey lining is super soft. Both the dungarees and the dress have adjustable shoulders, and we can also roll up the legs of the dungarees and secure with buttons meaning that these garments will grow a little bit as our girls do. For babies Dotty Dungarees use buttons instead of buckles on the shoulder strap, and also have zips in the legs for easy nappy access. With the dress, sizes in the 0-3 years range include matching cotton jersey pants to cover their nappy for a co-ordinating outfit. 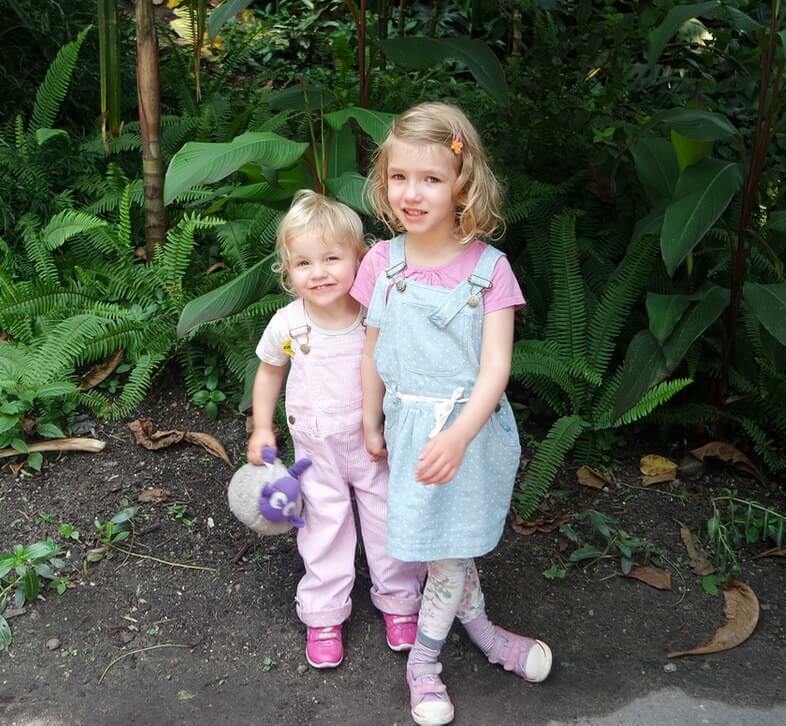 We took the girls to the Eden Project while we were in Cornwall and they both wore their Dotty Dungarees outfits and looked really sweet together. We even had some nice compliments on their outfits as we explored the attraction. Both girls gave their outfits a nice ice cream coating – Lydia in particular – and I’m pleased to report that they washed really nicely and came out looking good as new. Both Lydia and Georgie find these super comfortable and they suit them beautifully. We did choose to use a ribbon as a belt for Georgie’s dress as she is so skinny and the dress was a little wide for her otherwise. Although these cost more that we would normally spend on clothes for the kids, they are priced correctly for their quality, excellent design and materials.